Downlink is a new space exploration game by the creators of Xtronaut. Xtronaut Enterprises' latest board game will take players on a journey across the solar system, letting them play as one of up to six international agencies doing space missions for science. 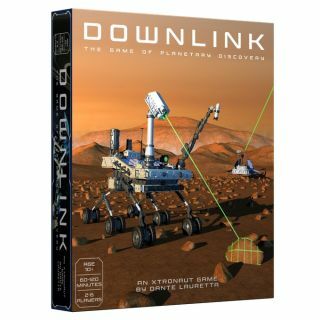 Called Downlink, the game encourages players to build rockets, build spacecraft, build science instruments — or even do all three things. And similar to real-life space missions, any choice a player makes will entail schedule and money constraints. "It [the game] is modeled on the way that NASA runs the New Frontiers program," said Xtronaut collaborator Dante Lauretta, referring to the program NASA uses to send spacecraft to solar system targets. "You can't go where you want; you need to go where the [National Research Council] Decadal Survey says where the priority science is," he told Space.com. Lauretta has personal experience with this process: He is principal investigator of the OSIRIS-REx (Origins, Spectral Interpretation, Resource Identification, Security, Regolith Explorer) spacecraft, which is scheduled to arrive at Bennu on Dec. 3. OSIRIS-REx is one of NASA's New Frontiers missions. Working with Lauretta in this project is Michael Lyon, whose space law experience included putting togetherDennis Tito's space tourism flight on a Russian Soyuz spacecraft in April 2001. (Tito paid $20 million for his eight-day flight to the International Space Station, through the Virginia-based Space Adventures company.) Lyon worked on the game's rule book and administrative matters such as fulfilling orders, while Lauretta focused on game mechanics and validating the science. In Downlink, players combine cards to pass through the phases of space mission development and eventually do science on distant worlds. This is the third board game for Xtronaut Enterprises. Past ones were Xtronaut: The Game of Solar System Exploration (which has sold 10,000 copies to date and won an award for board games from Good Housekeeping) and last year's Constellations: The Game of Stargazing and The Night Sky, which received the Mensa Select award. Both games launched after highly successful Kickstarter campaigns that exceeded their fundraising goals. The early parts of the game focus heavily on launching logistics, where players can compete or collaborate to get rockets and spacecraft into space. But as the missions evolve, players also have a chance to perform science at their target worlds; one example could be to search for an underground ocean at an icy moon, using instruments that contribute results to fields such as astrobiology and geology. "It's really interesting, and I've watched a lot of play-testing," said Lauretta. "The level of strategy in the game is very high." Lauretta said Xtronaut Enterprises is considering several other game concepts, among them one that will follow the real-life science performed by OSIRIS-REx after it reaches the asteroid Bennu. OSIRIS-REx should enter orbit around Bennu in early January 2019, perform observations and measurements, and then attempt touchdowns to collect sample material in July 2020. It will return to Earth with its precious asteroid sample cargo in September 2023.